I love pork chops! If you are like me, you only have a few recipes how to cook these little gems and so it doesn’t make it in you menu plan very often. I have been on a mission to change that! I guess you can say I have been having a love affair with my oven ready skillet, lately. It has changed my life! It’s a great way to get a crispy pork chop without drying it out. I will be making these incredible morsels a lot! I thought that they would taste good but I wasn’t ready to have my socks knocked off! This would be perfect for a weekday dinner with your family or a fancy dinner that you are trying to impress! Preheat oven to 400 degrees. Season your pork chops with salt and pepper. In a pie dish, combine Panko, Mozzarella, and parsley; set aside. In another pie dish pour in your flour and in a different pie dish will have your beaten eggs. Working on one at a time, dredge the pork chop in flour, then dip into the eggs and then finish off with the Panko mixture. You will need to press to make the coating stick. In a oven ready skillet, melt the butter on a medium heat. Add the pork chops and brown on each side for about 2 to 3 minutes. Place skillet into the oven and roast until completely cooked through, I did 8 minutes on each side. sauce: While the pork chops are cooking, make your sauce. In a saucepan, melt the butter and then add the garlic. Cook, stirring frequently, for about 3 minutes. Add the chicken broth, heavy cream, Mozzarella cheese, parsley, and lemon juice. Season with salt and pepper, to taste, and stir constantly. Bring to a boil; then reduce heat to simmer and let cook until it slightly thickens. Serve the pork chops immediately with the sauce drizzled on top! Delish! This would be perfect for a Mother's Day dinner! This looks amazing… Pinning and I can't wait to make this because my husband is going to love this! This looks so yummy and the pork chops in the freezer now have a new purpose come Thursday night. 😉 I'll definitely be using this one. Here from Tips and Tricks. Keep up the fab! My nana is in love with pork chops but I'm running out of ways to prepare them! These look simple an delicious! Thanks! Oh many my hubby loves lemon so much! He's going to be excited over this one! You had me at lemons, Kimberly! Your chops look SUPER yummy, and I can't wait to try your recipe! Thank you so much for sharing at The Wonderful Wednesday Blog Hop! PINNING! Wow, I love this recipe. Pinning and can't wait to try it. This dish looks delicious – the colours are amazing! Love the sound of this wonderful creamy, cheesy, lemony sauce as well. Pinned. Thank you for being a part of the Hearth and Soul Hop. 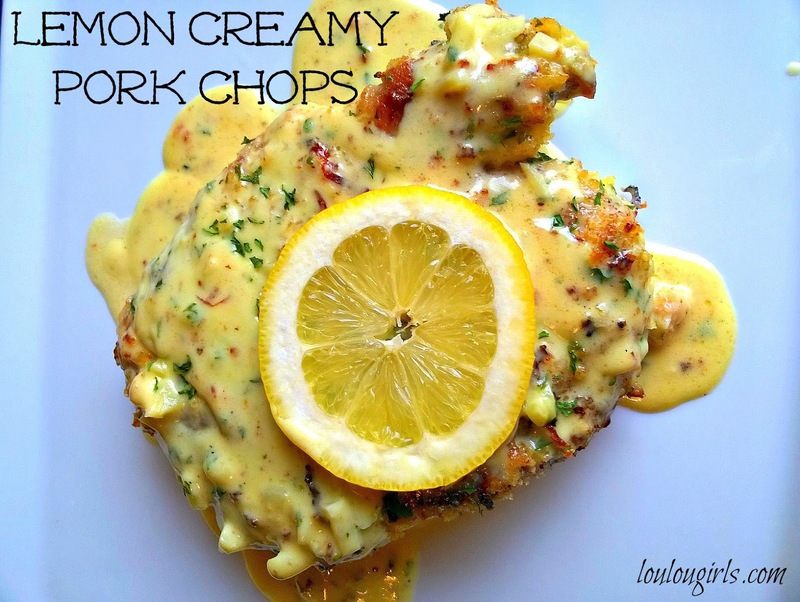 I can't wait to try this awesome recipe, Pork Chops and Lemon what a great combo! Thanks so much for sharing them with us at Full Plate Thursday and come back soon! I don't know Kimberly but you gals keep coming up with delicious recipes. Thanks so much for always linking up with Thriving on Thursdays. I'm featuring this one at tomorrow's party. What a great recipe!! YUM! Thanks for sharing on My 2 Favorite things on Thursday!! Hope to see you again tomorrow!! Pinned! I can’t begin to express how amazing these delicious pork chops were. I substituted gouda (that’s what I had in the fridge) for the mozzarella and the flavors were delectable. My husband almost cried when he had to toss out the extra sauce☺ Thanks for sharing. If I don’t have an oven ready skillet, can I just transfer them to a baking dish? Is there a special thing you did to get your sauce the yellowish color? Mine came out more white? I don’t know why there would be a difference in color. Mine too!! I mean… it makes sense- nothing yellow really went into it. Lemon juice is pale yellow and cloudy at best. Definitely not bright yellow. Not sure how her’s ended up that color. It’s almost like she threw a yolk in there! I don’t know why mine looks yellow. Sorry guys! I hope it tasted yummy! I think it must of been the lighting, but it is so good! Definitely doubling the sauce when I make this. I like pork chops, cooked many ways. I don’t think I’ve ever seen a recipe as tasty as this! Pork is so underrated and doesn’t get the credit it deserves! This sounds fanatbulous! That sauce…yum! I love this idea! Have never tried something but the flavours seem like such a good marriage! And I love me a pork chop! I pinned this recipe! It’s making me so hungry! I’m gonna make it one these days! I can’t wait to share this recipe with my husband. He does a lot of the cooking these days, and this sounds like something he’d love! These look so delicious. I really love using panko breadcrumbs in my recipes. They add a great crunch and soak up all the flavors. I’m also a big fan of lemon sauces. The sweet, tart flavor is perfection. what a delicious way to fix pork chops. I love the flavor of lemon so I know I must try this recipe ASAP. I love anything with lemon on it or in it. Looks like you cooked it in a cast iron skillet…so I bet it was excellent! I don’t eat meat, but this looks amazing! I know that my mom would this recipe since she loves pork chops. I’ll have to share the link to your recipe with her! Lemon is such a lovely flavor to work with when you’re cooking meat. I think this dish is worth a try! I love the flavors that are present in this dish! Definitely want to make this. Looks delicious and would be great served with steamed white rice! Yum!! 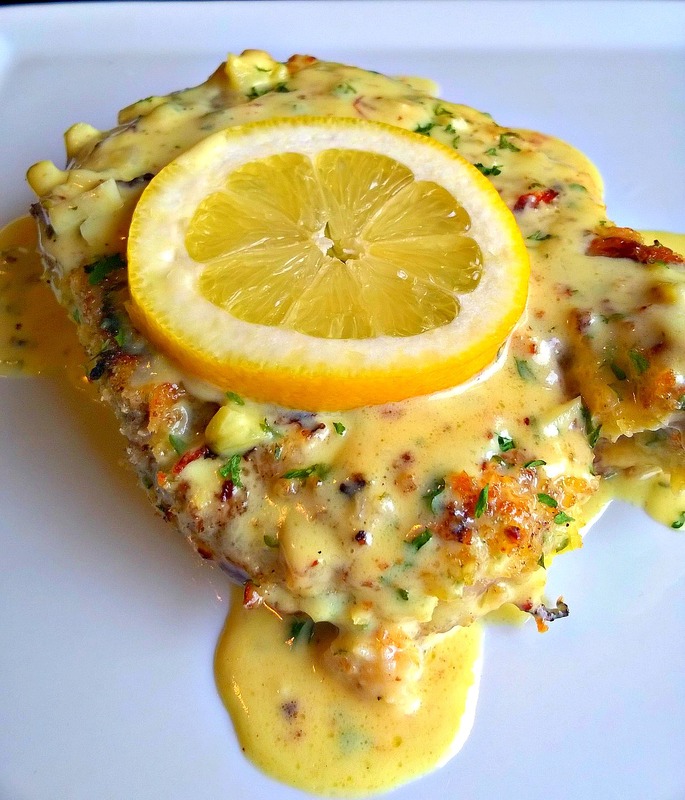 That creamy lemon sauce looks really good. I would like to use that recipe on chicken since I rarely eat pork chops. We just started enjoying pork chops on a regular basis again when I realized how much my kids loved them. I am saving this recipe. It sounds delicious and so flavorful! These pork chops with lemon look delicious. I always like to try new recipes. This pork chop recipe looks great even though we have never made them. I will share this with anyone who will love this. We are a huge fan of pork, and don’t eat it often enough. This lemon cream sauce sounds like a wonderful touch. Big fan of creamy foods! I love pork chops, and normally use a lemon pepper seasoning. This looks absolutely delicious! Oh this looks and sounds so delicious!! Going to give this a try!! This sounds dreamy! I am so boring when it comes to pork chops I do the same thing over and over again. The sauce sounds like a great change to what I do! This looks so good! Simple ingredients can make the best meals. This pork dish is one of them. 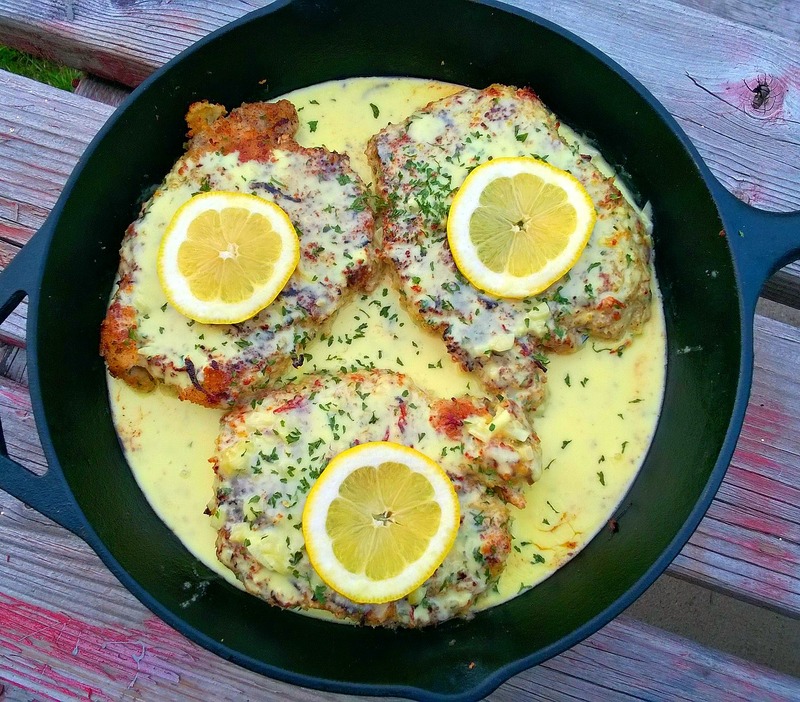 I love lemon, my husband adores pork chops…. a winner for my family! It doesn’t look to hard or too time consuming, either. Thanks for the recipe, it will brighten up our winter plates! These pork chops look really tasty. I am saving your recipe because although my husband loves pork chops, I’m not a fan because I can never cook them right. These look absolutely delicious! I make pork chops at least once a week, and I am always wanting new ways to make them. I will have to try this out one day soon. This is a great recipe to add to my weekly dinner ideas. No more chicken nuggets in this house!! I have a few pork chops in my freezer that I was just thinking “what the heck am I gonna do with these?” Lol. Then I read this! Thank you! Oh wow these look to die for! I have pork chops in my freezer waiting for a tasty recipe! Wow, these look great! I’ll have to pass this recipe on to my mom, she LOVES pork chops, and lemon is her very favorite flavor — I just know these will be a hit! I substituted sour cream for heavy cream and parmesan instead of mozzarella….. I can’t wait to try this awesome recipe, Pork Chops and Lemon what a great combo! Thanks so much for sharing them with us at Full Plate Thursday and come back soon! A couple of observations: the sauce definitely is not yellow like in the photos above. Lemons are yellow and not almost orange like in the second photo. Yes, you eat with your eyes first but people feel like they’ve failed when they can’t duplicate the photos that are posted. I added a granulated chicken bullion to the sauce to add a touch of color plus chicken broth from a box. You have to be careful not to add too much granulated broth or it will be very salty. Also my pork chops were at least an inch thick and I didn’t have a cast iron skillet large enough for 4. So I used a casserole dish but then you won’t get the browning you would from a cast iron skillet. Next time I’ll pre-heat the casserole dish. I also used a meat thermometer and cooked them to exactly 145 degrees and they were fabulous. I also added some corn starch to the sauce because it shouldn’t run all over the plate but sit where you put it. your right, in the picture, it does look yellow. I can’t remember what I did to make it look that yellow when editing the picture. The fact is it’s my favorite dish! These look so good! I love the sauce! Sharing, including on the Hearth and Soul Facebook page tomorrow. Thank you for being a part of the Hearth and Soul Link Party. Have a wonderful weekend!